Available as a convenient pack size of 20 invitations or else select the “1 invitation” option and add exactly what you need to your cart. 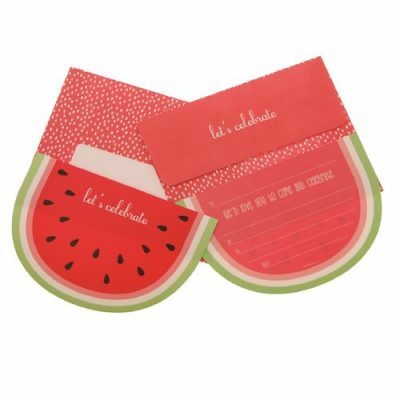 Our Invitations ~ Watermelon Crush are PERFECT for a summertime party! They are fun, bright and very summery. Lovely for use as kids birthday party invitations but we think they would be fab for a baby shower or other grown up party too! This invitation kit includes a watermelon wedge shaped invitation which is printed of both sides of very good quality card stock and a coordinating envelope. Pack size: Available in a convenient pack size of 20 invitations or else purchase them singly so you can get exactly what you need. For more ideas for your watermelon party, see our watermelon party theme range.